The final GC6 assignment was completed today. 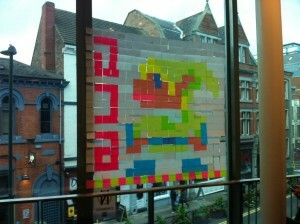 We had over 60 Agents working together to create 2 large scale visual trauma triggers, Post-it War style, in 2 prominent city centre locations. I arrived at the location “Broadway Cinema” shortly after 12:00 hours, having met up with Agent Z. I could see that he was pointing up to a room, in particular the mezzanine, and assumed that there was where I had to go to make my contact. 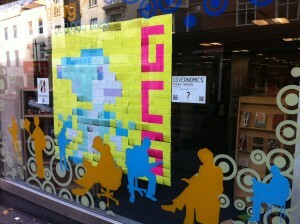 However I encountered some sticky notes upon the window. This had me flummoxed, as I could not find a bowler hat in sight. So I left the premises, when I noticed that Agent Z was now pointing inside the building, where I met my contact. I followed out the instructions on the mezzanine and left shortly after. After the operation was completed, around 15:30, I went back to the location to take photographic evidence of the complete trauma trigger. You shall find it enclosed. Apologies for the quality, the tint of the windows did not allow a good view of it. This will likely be my last report, it was a pleasure working with you. others taking up available seats near contact & overhearing exchange. from view & CCTV. Read mission brief & then located target area. be paying attention to activities. notice this & deploy incorrectly as a result. exited the vicinity at 12.33. ICNSI-GC6-02, as I had struggled to get a good image on that occasion. image & deploy to social media networks. Images attached & usual precautions (TOR, Metadata removal) as usual.